PENGUIN SERIES P-X CPVC EXTENDED VERTICAL IMMERSIBLE PUMPS (Model PX-10AK) are simple in design, efficient in performance, and self-priming when immersed in solution. Constructed completely of CPVC with PTFE wear ring, or CPVC with PVDF impeller where in contact with the solution, this pump is suitable for pumping, agitating, filtering, or circulating acid and alkaline solutions, abrasive fluids, and other corrosive solutions up to 180 degrees F maximum temperature. Standard motors are three phase and totally enclosed fan cooled, with two part epoxy coating for additional corrosion resistance. A rigid, solid stainless steel rotor/drive shaft with an oversized bearing is employed to minimize shaft alignment problems, while allowing for quick and easy bearing replacement when required. The three phase motors are shipped unwired. A standard air purge/vent screw assembly in the bottom motor housing extends the life of the bottom motor bearing when utilizing minimal 5 psi air to create a positive displacement. An optional ceramic sealing sleeve is available for added corrosion resistance in preventing fumes and condensables from contacting the metallic shaft or impeller insert. 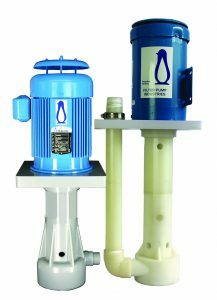 Penguin vertical pumps are versatile, easy to install, and require a minimal amount of tank space, thus saving valuable floor space.